Wait, the boo-bees?? Is this a new Halloween game I never heard of?? (or instead of) the candy bowl, there’s a bee hive! No no, I think he’s talking about the BooBees t-shirt on splitreason. Maybe he thought she had one in her closet? Why yes sir, of course! I had no idea this was a shirt-free zone! And this is why everyone should have a picture of some blue-footed boobies ready and waiting on their xbox. 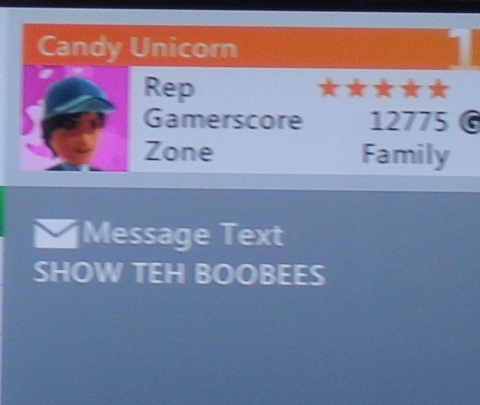 Amazing that a guy with the User Name: Candy Unicorn is even interested in breasts. I like that his “zone” is set to family. 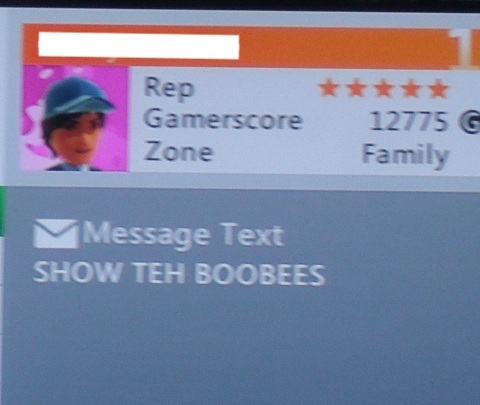 So it’s obvious that his mom set up his account when he first got xbox, years before the horrid adolescence he endures now. Hehehe! Sexist pig…makes me think of that um, Lizbet Salander movie!